1- The IG report was not ‘secret’ knowledge from Qanon. There has been talk of it at least as far back as 2016 (perhaps earlier). 2- John McCain was Not tried and executed by secret Military Tribunals or faced any kind of justice at all, but in fact, died due to health issues. More specifically, he died of brain cancer. There are several types of brain cancer. McCain specifically died of Glioblastoma, which is the most aggressive cancer of its type that begins within the brain. Furthermore, patients diagnosed with this type of cancer are expected to live less than two years. 3- The Awan brothers were supposed to be jailed for selling military intelligence to foreign governments (among other chargers). That of course, never happened. 4- JFK Junior is NOT alive using the name of Vincent Fusca. This was debunked in this excellent post by Douglas Stewart. 5- There are not 70000 criminal sealed indictments. They have been debunkedd on several occasions. 6- Trump is not ‘massively’cracking down on pedophilia. 7- Q clearance personnel are not put in charge of military operations, nor do they have access to military intelligence. 8- NSA and military do NOT use Tripcodes for their security systems. 9- The banning of Qanon from Reddit was not due to having secret information, but due to the fact that some of the moderators are the SAME people behind the Q-scam. The community was banned due to violence. 10- People HAVE ASKED about Qanon and have been told is fake. 11- Hillary Clinton was going to be arrested. 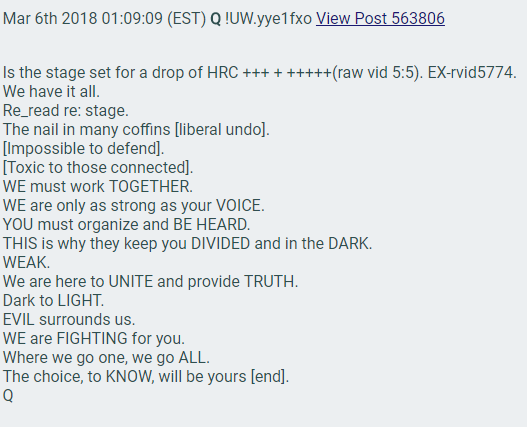 The claim made in Qanon’s very first post. Riots were expected to occur and the National Guard was to be deployed after National Emergency was declared. 12- The Mass arrests. Of course Qanon promised mass arrests. Another lie. 13- ‘The stage is set’ aka Frazzledrip: The stage was set to release a video of Hillary Clinton and Huma Abeding allegedly ‘filleting’ a child’s face, as claimed by prominent Qanon figures like Liz Crooking. Something so evil that it ‘would be impossible to defend and ‘[liberal undo]’. Obviously that never happened either. 14- ‘The Flood is coming‘. A flood consisting of various forms of media that I imagine were supposed to implicate somebody in something nefarious. Sadly, this flood never came. 15- Trust Sessions. Jeff Sessions was mentioned 169 times by Qanon. He led people to believe Sessions was planning secret military tribunals with Trump and his team. Sessions was going to ‘drop the hammer‘ and ‘drain the Swamp‘. Sessions got fired. 16- “11-11-2018” was going to be the day ‘America will be unified again‘. Of course nothing happened. 17- “11-11-20018” there was going to be ‘A parade that will never be forgotten‘. There wasn’t one. 18- What’s more, conflicts with Iran would also have been resolved by 11-11-2018. That of course, was another lie. 19- Rod Rosentein was going to be fired or removed from DOJ. Rosentein resigned due to differences with the White House. He first gave a verbal resignation that was not accepted and Trump postponed their meeting for several days. As a matter of fact, he is still hanging around in his post and it seems that he won’t leave until February of this year (2019). 20- December 5 built up to ‘nothing can stop what is coming‘. Nothing happened. Bizarrely Qanon goes after people on Twitter with blue check marks, claiming they’re spouting a false narrative about arrests that were supposed to have been made that particular day. 21- Qanon announces that the “Mueller insurance policy has expired”. Earlier that day Mueller had been granted a 6 month grand jury extension. 22- General Flynn was going to be cleared of all charges. According to Q, ‘Flynn is safe‘, because ‘patriots protect patriots‘. As it turns out, Flynn pleaded guilty to “willfully and knowingly” making “false, fictitious and fraudulent statements” to the FBI regarding conversations with Russia’s ambassador. You can read here Flynn’s statement of offense. His sentencing has been deferred several times. Let’s not forget that this ‘patriot’ was literally told by the judge that ‘he sold out his country’. Why would that be? 23-‘Big Month’ April. 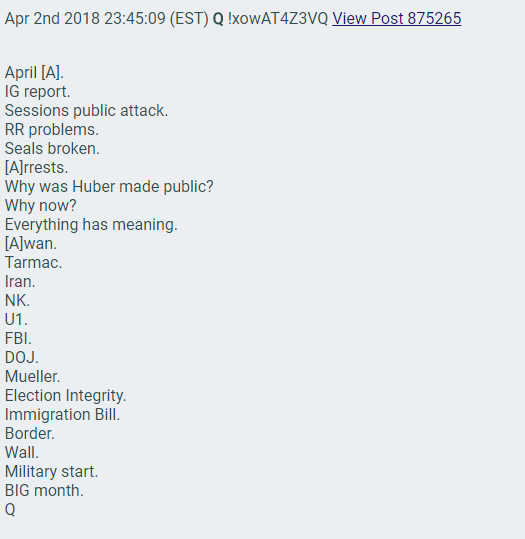 April was supposed to be a month full of happenings, including, but not limited to: arrests, the rrelease of the IG report (the report was released several months later and, as explained in post 1, it had nothing to do with Qanon), the wall, “military start” and unsealed indictments. Of course none of it came to pass. 24- Manafort was a ‘plant‘ put there to help Potus. Qanon implied that POTUS and team will not let Manafort suffer the “wrath of the Cabal” because he is a good guy. Despite undeniable evidence of numerous wrongdoings over the years. Manafort, Trump’s former campaign chairman, was indicted on 12 different charges, including conspiring against the US. He originally was indicted on 8 charges, then he lied under oath and a few extra charges were brought in against him. 25-Qanon spreads the idea that Justice Ruth Ginsburg was going to retire soon based on her missing work. The same day she announces that she will return to work and is cancer free. Not only is she very old (83), she has had lung cancer and other health-related issues that have been known for many years because she has given interviews about it before Qanon. A very old lady falling and breaking her ribs, with a history of cancer and other diseases, is not insider information, is pure cold reading and predictions that any of us could have made. What it is even worst, is that all the Qanon folk are clamoring for ‘proof of life‘. Because, apparently, she is not allowed to recover in peace away from the public eye. If she doesn’t do it in public, then she is obviously dead. 26- Red October was going to bring a ‘Red Wave‘ and a ‘Red Tsunami‘ because, according to Qanon, ‘mid-terms are safe‘. But, as every other claim from the so-called-military inteligence, the Democrats won the House of Representatives. Further evidence that the QAnon community is giving up hope of seeing any high level arrests of the deep state or cabal in October. 27-‘March Madness’ and ‘the public will know soon’. Again, nothing happened. 28-Vice-President Mike Pence posted an accidental photograph in his official twitter account of a SWAT officer wearing a Qanon patch. The photo was promptly deleted and since the officer has been demoted. However, to Qanon followers, that was a sign that confirmed Potus and Pence were part of the Qanon team. 29- FEMA alerts. 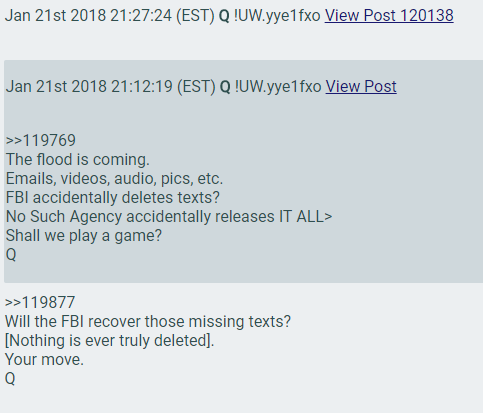 According to Qanon followers, the testing messaging system by FEMA meant that the president was going to ‘alert‘ the nation via text message of the Deep State’s ‘criminal activities’. Once more, this wasn’t so. But if you look closely, the ‘secret information’ came from CNN. And, a few days before Q himself posted this, the information had already been released by Mashable. 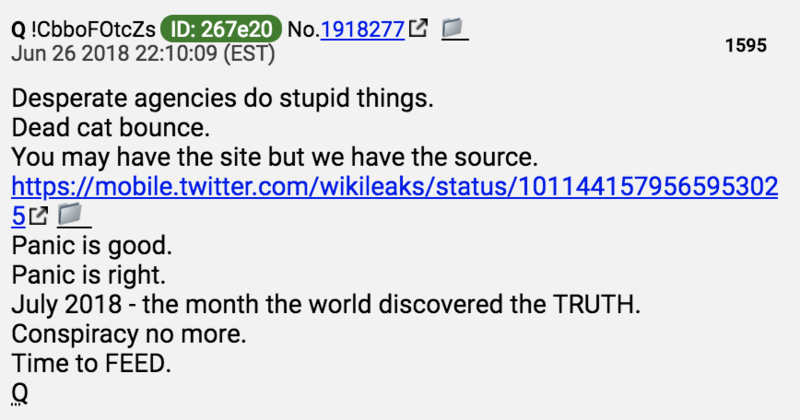 30-July: ‘the month the world discovered the truth’. Of course, nothing happened either. Edit: I have been asked to extend the proofs both on the general drops and on the images. I will be adding more as I come across them or as I get suggestions (i.e. comments/emails/etc). For ease, I will be changing the numbering of images going from 1 to ∞ so that I don’t have to keep updating every single number every time I post a new proof. On the normal ‘text’ proof, the numbering will continue from the last bullet point as normal. 31- Huber and the 470 members of stuff. According to Qanon “General Michael Horowitz, who is working with Huber, has a staff of 470 investigators, giving Huber access to enormous investigative firepower that far exceeds the staff of any special counsel“. Once more this is wrong as it refers to the budget request that 470 is the total amount of employees in the OIG. It seems that somehow all 792 satellite communications were down at the same time, along with some nearly 900 others they could have use to draw resources. 1- These edited images were supposed to be irrefutable proof that Qanon was inside Air Force 1 with Donald Trump. The images were in fact taken by ABC’s photographers during Obama time. What’s more, Paul Furber, one of the main coders behind 8chan that fervently promotes the cult, did a debunk himself. He blocked me after I pointed this out and asked a few other questions. Can you point specifically which parts of this are actually true & not pure speculation? What parts are also 'super secret highly classified intel' & not public source? 2-Yellow vest protesters in Europe. 3-This was supposed to confirm Qanon had insider knowledge by posting proof of Executive Order. The image is yet another forgery. 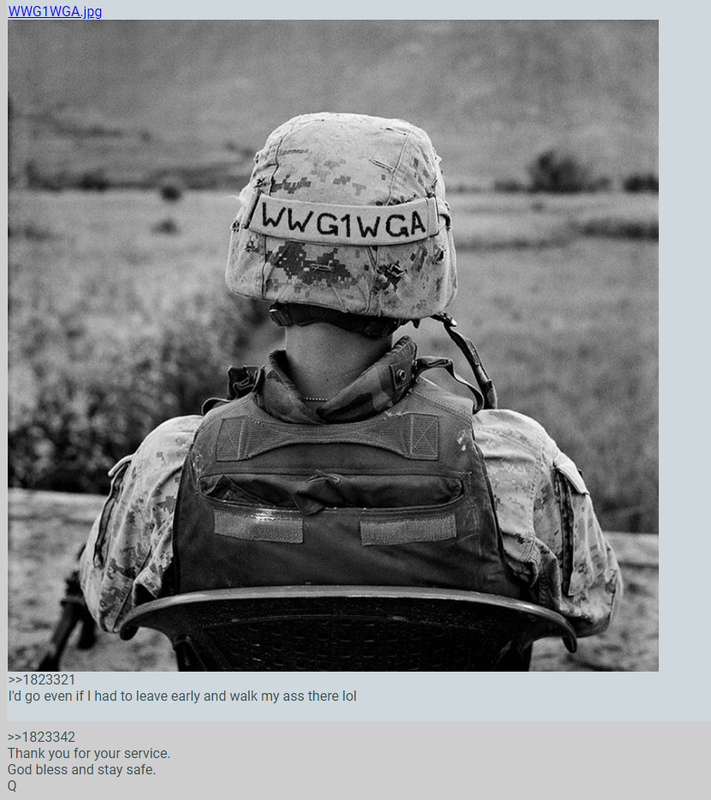 4- Another photoshop where Qanon engages as if it was real. 5- 99 Portland St, Hong Kong. Yet another photoshop. And altered old image that doesn’t even match the current view of that particular street. Yet again, another debunk done by pro-Qanon supporter Paul Furber. 6-‘The world is watching’. This time from Barcelona. Another fake image. I actually spent countless hours on Spanish newspapers and media to confirm the image. It is fake. 7- Jet fighter pilot. Last night (1st Feb. 2019), after several days of silence, Qanon decided to drop another photo. This one has many followers scratching their heads. Read the thread below for some interesting remarks as to what the Qult thinks it all means. While the photo was referenced in a 2017 article, it’s origins can actually be traced to 2014. This is an all-time low for Qanon, because it appears they actually taken it from this site, and they can’t even be bother any more to use filters and crop it to pass it off as authentic. So, the super-secret military intelligence is using stock wallpaper photos to prove they have insider knowledge. 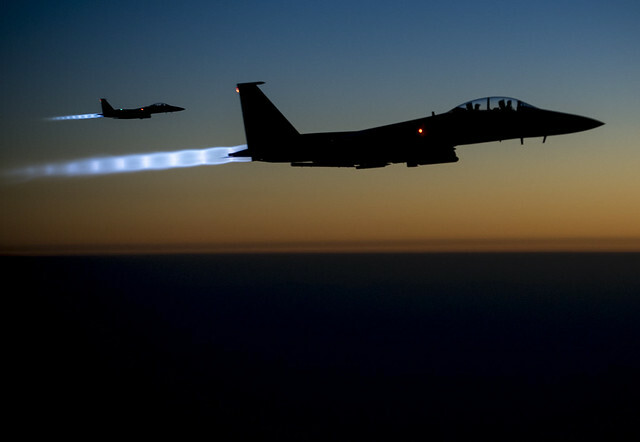 The earlier version of this photo (the original from 2014) was posted in the US Department of Defense’s own Flickr account. The list above is by no means comprehensive nor does it include every claim or photograph ever made by Qanon. However, it does prove a very fair point: if basically the main narrative that has been pushed by Qanon group is fake, and so are the photographs, what exactly are you left with that is true? If you are interested in more debunks, take a look at this post. It shows plenty more failed predictions that are not listed here. Most of the Qanon community quotes this video of General Flynn using the words ‘digital soldiers‘ as ‘undeniable proof’ that Flynn himself is part of the Qanon group. It is simply stupid to image that intelligence agencies with the most sophisticated softwares in the world and the brightest computer scientist suddenly need bored people in their own sofas to ‘find information’, when they themselves can have it at ‘the blink of a click’. #1. Q drop #151 on Nov 14 2017 asked “Why would sealed indictments be outside of DC jurisdiction?”. The news that Sessions had appointed a DOJ prosecutor John Huber working with the IG did not come out until March 29 2018 when Sessions wrote a letter to Grassley, Goodlatte and Gowdy – Q hinted at it again on March 10 2018 (drop #921). To me this is one of the most significant Q proofs. #7. Just read the link you posted with this point, there’s a handy diagram. People with a Q level security clearance DEFINITELY have access to military intelligence which is on JWICS, SIPRNet and other restricted systems. #11. No-one, including the LARPers claiming to have created Q as a 4chan troll, is claiming the post you’re quoting about Hillary’s arrest as coming from Q. #26. You’re cherry picking here. Q also said 53:47, which turned out to be the exact result of the Senate mid-terms.The statement “[Blue wave] their entire future depends on winning the majority in the house” refers to the Democrats (Blue), so it’s hard to see how Q is moving the goalposts with Republicans winning a larger Senate majority. I did say it was not every single debunk. I will up more to it in the next few days because people have been asking me for more. So I will add more explanations and I will add more debunks and photographs. Other things i left out will be explain in follow up posts.